The What: Da-Lite has introduced the Parallax Stratos 1.0, which is designed to deliver a high-value solution for rejecting ambient light in large scale projection. The What Else: Offering the freedom to install seamless ALR screens up to 16 feet in height, Parallax Stratos is available in a wide array of core Da-Lite tensioned electric and fixed-frame options. This Contrast Based ALR surface rejects up to 80 percent of ambient light with 1.0 gain for standard-throw projectors (1.0:1 or greater). The Bottom Line: Contrast Based ALR prevents projected images from appearing washed out by maintaining and enhancing brightness. The gray color and other proprietary design elements in the surface combine to absorb ambient light rather than reflect it. 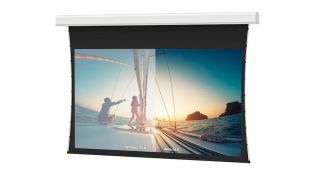 Da-Lite Parallax screens combat environmental and projection deficiencies to produce bright, crisp images.